All of the artwork has been removed from the building on Vinalhaven, which is deteriorating because of a hole in its roof. VINALHAVEN — The home of the late world-renowned artist Robert Indiana has been named as one of Maine’s most endangered historic places. The Star of Hope in downtown Vinalhaven was added to the list Tuesday by Maine Preservation. The nonprofit organization, based in Yarmouth, has been compiling an annual list since 1996. It says its goal is to raise public awareness to preserve properties. Maine Preservation has identified 158 endangered historic places since 1996 and says that 55 have been saved, 44 are in the process of being preserved and 18 have been demolished. 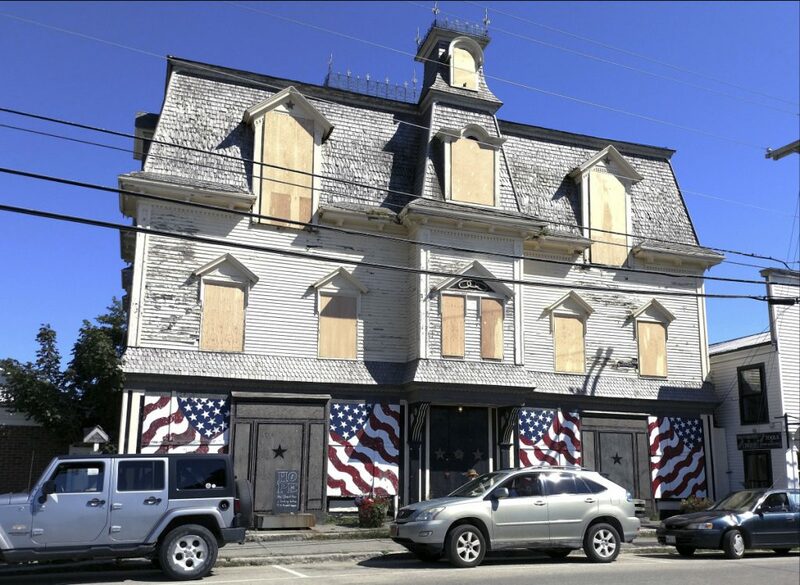 “Today, the Star of Hope towers over Main Street, but windows are boarded up, there is a tarp over a hole in the roof, and the exterior clapboards and sheathing have deteriorated significantly,” Maine Preservation said in a news release. Attorney James Brannan of Rockland, the personal representative of Indiana’s estate, said Thursday that architects have concluded the bulk of the immediate needs for the building are driven by water entering the building’s roof and skylight. “In order to stop further deterioration this will be addressed by a roofing company within the next few weeks. The building will then be winterized and closed until spring. All artwork has now been removed from the Star of Hope,” Brannan said. In the two years before his death, Indiana paid $170,000 for materials and labor in making repairs to the Star of Hope. Brannan said he hired two architects who had surveyed the Star of Hope in 2008 and 2012. They returned to the building in early October and spent three days identifying the immediate and crucial stabilization needs, while recognizing the need to be nondestructive to the historic fabric of building. The building will ultimately undergo complete restoration and conversion to a museum in accordance with Indiana’s will. “It is unlikely this will happen until the litigation which the estate is involved in is resolved by settlement or jury verdict,” Brannan said. According to Maine Preservation, The Star of Hope Lodge, founded in 1874 as the local Independent Order of Odd Fellows, met for generations above the M.K. Kiff store. The Odd Fellows purchased the store and the adjacent building, joining the two and adding a mansard-roofed third floor in 1885. The clapboard building continued to house retail on the first floor, while the second and third floors functioned as meeting space and a lodge hall for the IOOF. Located on the north side of Main Street, it is one of the largest buildings along the waterfront and a reminder of the prosperity of Vinalhaven’s granite industry, according to Maine Preservation. The IOOF hall used the building until the 1930s, after which a drugstore occupied the first floor. In 1969, the order sold the building to noted photographer Eliot Elisofon, and Indiana subsequently rented the building. In 1977, after Elisofon’s death, Indiana purchased the property, completing a full restoration in 1981. It was listed in the National Register of Historic Places the following year and Indiana used it as his home and studio until his death in May. The other properties added Tuesday to the endangered list for Maine are the Clough & Pillsbury Building in Rumford, the Frances Perkins Homestead in Newcastle, the working waterfront in Boothbay Harbor, historic Maine dams across the state, the Cushman Tavern on the Lisbon-Sabattus town line, and the McGlashan-Nickerson House in Calais.